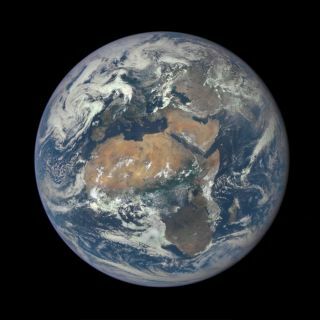 A view of Earth from space from the NASA/NOAA Deep Space Climate Observatory satellite. The midpoint of winter in the Northern Hemisphere begins on Feb. 4, 2016, not on Groundhog Day (Feb. 2). Once again, Groundhog Day (Feb. 2) has come and gone, and if you're in my line of work – a broadcast meteorologist – you know that it's the day each year that everyone looks to Punxsutawney, Pennsylvania for a forecast of whether we will see a continuation of winter, or whether we will enjoy an early spring. "If Candlemas be fair and bright, Come, Winter, have another flight. If Candlemas bring clouds and rain, Go, Winter, and come not again." According to the Stormfax.com website, as of 2015 Punxsutawney Phil has made 119 predictions, with an early spring (no shadow) having been forecast just a mere 17 times (14.3 percent). Stormfax also states (without evidence or corroborative references) that as of 2015, Phil's predictions have proved correct only 39 percent of the time. Although thought of as the "traditional" halfway point of the winter season, Groundhog Day actually falls a couple of days short. Winter's midpoint will occur this week on Thursday, Feb. 4 at 6:21 p.m. Eastern Time or 3:21 p.m. Pacific Time. But although the altitude of the sun has been slowly climbing and the length of daylight has been increasing since the winter solstice on Dec. 21, any changes up to this point have been relatively subtle. However, from now through early May the increasing altitude of the midday sun and its corresponding lengthening of the daylight hours will become more and more apparent; for at no other time of the year do these two values rise so markedly. For example: On the first day of winter at Seattle, Washington, sunset occurred at 4:20 p.m. and the length of daylight (from sunrise to sunset) reached a minimum of 8 hours and 27 minutes. Today, Seattle sees the sun set at 5:15 p.m. with a mere 77 additional minutes of daylight having accumulated since Dec. 21. But by March 19 – the date of the vernal equinox for the western U.S. – the length of daylight in Seattle will have increased by 144 minutes since Feb. 4th. And because daylight saving time begins on Mar. 13th this year, by March 19, the sun will be setting well after 7 p.m. (7:21 p.m. to be exact) from the Emerald City. Interestingly, for many northern locales, long-term records indicate the first four days of February are the coldest of the winter. But average daily temperatures rise rapidly thereafter, so that by the last week of the month they are higher than any day in January. Meteorologists, in fact, consider that the winter season is over at the end of February; they consider "meteorological winter" to be defined by the three coldest months of the year: December, January and February. So for all those winter weary souls, take heart: we're about to turn the corner. In the days and weeks to come, you'll more readily be able to sense the greater amounts of daily light and see the more northerly position of the afternoon sunsets on the horizon. And soon the weather will correspondingly respond as well. As for the groundhog forecast: To see or not to see … the shadow knows!